Please note only Fortress branded goods will be honored by our guarantee and after-sales service. If you receive a unit without the Fortress logo, you should consider it counterfeit and return to the seller immediately. The Fortress S03-A is the ideal starter kit for anyone wishing to install a security system inside the home. Complete with magnetic sensors for windows and doors, the unit detects any forceable break in as well as any suspicious movement in rooms by means of the passive motion sensors. The S03-A comes with two passive motion detectors and five door contact points. 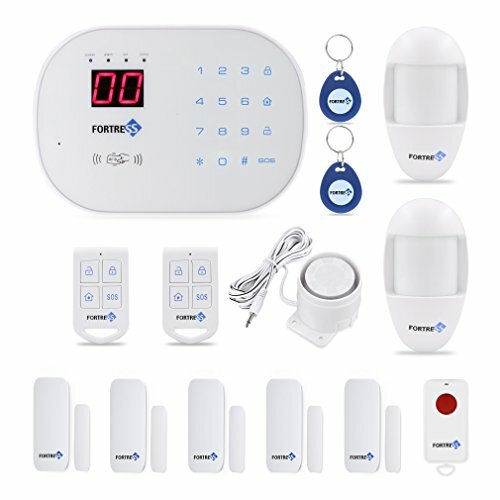 Easy to install and setup, you’ll have your own security alarm system running in no time! Fully programmable, the S03-A will automatically call a designated number in case the security system is breached. It can also be used to play a recorded message or custom sound. Worried there is someone in your house? Call the system from your phone and actually listen to what’s going on. Deactivate the device by punching in the number on the keypad, or disarm before you even get in the front door with one of the two supplied keyfobs.